I'm not sure I'm following you - if the ruler is square - then all sides are equal, otherwise it is a rectangle ruler. It's that way so you can put the edge of the ruler at the corner of the fabric at the measurement you want and only have to make two cuts to get a square. I don't like to cut large squares, I always mess up. Last edited by BellaBoo; 08-12-2013 at 11:19 AM. that use the less common 3" but that would finish at 2.5". that the 3.5" sides are on the sides of the fabric that you will trim. Ignore the 3" sides. Does that make sense? 3.5" strip and then cut 3.5" the other way. bearisgray - it is, it's the fabric square that you turn. The 'fabric piece' still appears to be exactly the same size in the second illustration. Just checked all of my square rulers and they are all perfectly square. You must have a special ruler of some kind. My square rulers are perfectly square too. 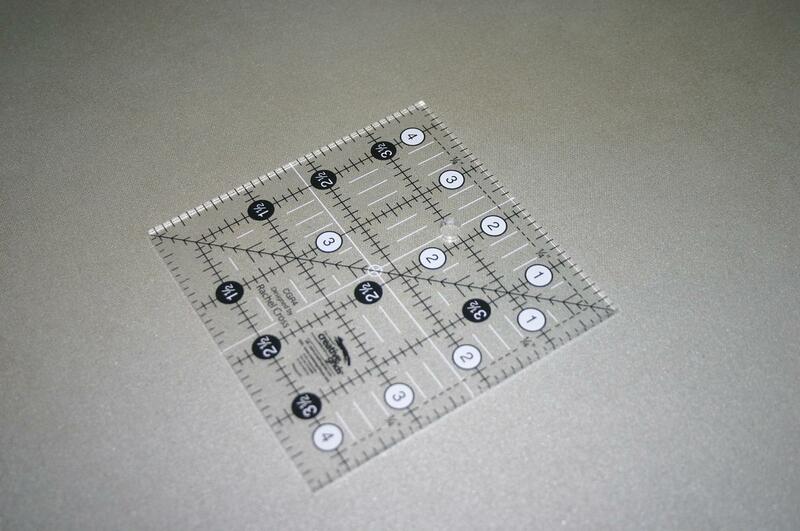 I didn't realize this kind of specialty non-square ruler existed. I can see all kinds of ways that it would mess me up. It would be interesting to learn how to use that ruler - I need all the help I can get when squaring up blocks. Can you give the name of the ruler or a picture of it? well you have to watch your ruler if you are using one larger than what you are wanting to trim. 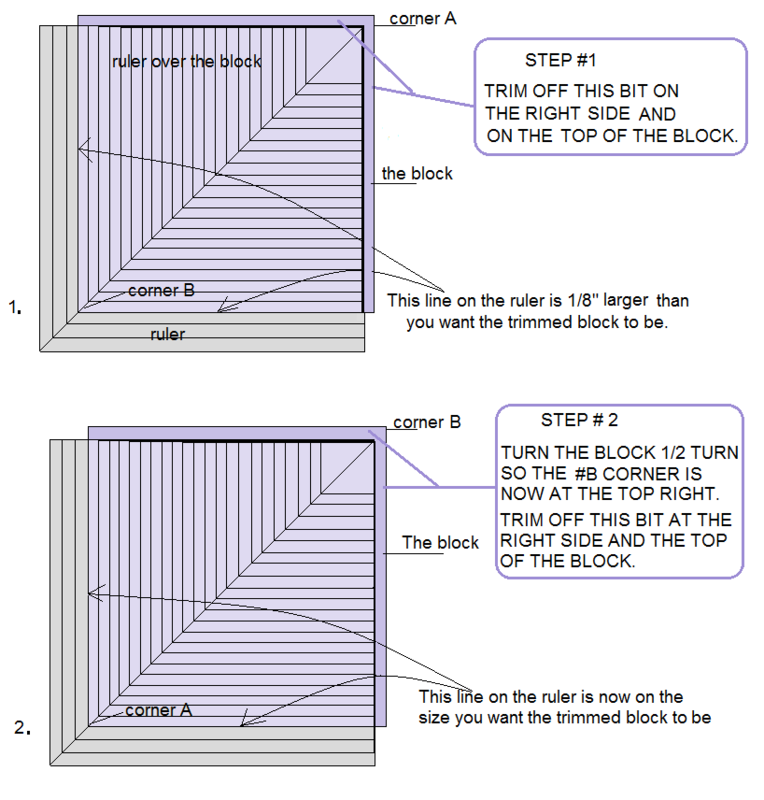 As in an 8 1/2 inch ruler but trimming a 3 1/2 inch block. and sometimes rulers with that 1/2 inch on the side can be irritating. my square up ruler has the markings listed differently on different sides. two sides are listed by the even inches and the other two sides are listed by the half inches. perhaps this is what the OP means. My rulers are all perfect squares. The best thing I have found is a 12 in rotary mat. With it you do not have to move the ruler, just turn the mat. The ruler itself physically measures 3½"x3½", but the markings read whole inches on two sides and half inches on the other two sides simply because they start from the one edge. You're dividing the space by a whole number plus a fraction, not just a whole number. Whole inch rulers are marked with full inches all the way around. If the center of the ruler were the center of the markings, with all four sides having ¼" around the edge, it might look prettier, but it would be much harder to use it for squaring or measuring of any kind. some of my rulers are the same. your 3 1/2 inch one, my 8 1/2 inch one. not all of mine have the extra half inch and I tend to get confused depending on which ruler I pick up, so I know what you mean. it's still square, just starts with a full inch instead of 1 and 1/4 which it would have to do if marked the same on all four sides. That's what I'm thinking. I have the Creative Grids rulers. Here's an example ... is this what you're talking about?? it's printed like this so you can easily use either whole units or half units when measuring. Also notice that there are two sets of each, with one printed left to right and the other right to left. You have a true 3 1/2-inch square ruler. If they put a 1/2 inch on all four sides your ruler would be a 4 inch square. If 1/4 inch was put on each side it would make your ruler more difficult to use if you wanted less than 3 1/2 inches. TWO SIDES START AT ZERO AND TWO SIDES START AT HE 1/2 INCH. Dang Cap Lock!! Both end at 3.5 inches. On the ruler above as an example. The white numbers are even numbers, the black numbers are 1/2 inch numbers. yep, those are the lovely rulers with 1/2 increments. so it is 3 1/2 inches square. The picture made by Jan on page one of this thread (post no. 5), didn't show up, but I think it is messed up. After you cut the first eighth off, you turn it around, but now the ruler should show 4 eighths that have no fabric behind, because you have cut an eighth off. Both rulers look exactly the same, and that is not correct. Last edited by maviskw; 08-14-2013 at 08:27 AM.